The Curtiss Mansion wedding and event catering venue is a wonderful 1925 Pueblo Revival home in the heart of Miami Springs in Miami Dade County. Like most locals, you may have heard of it, but it’s truly one of Miami’s best kept secrets to celebrate together for catering events, anniversary parties, weddings, baby showers, rehearsal dinners, birthday parties and once in a lifetime special events. This Doral wedding venue is truly a Miami Grill Catering favorite. It was originally the home of aviation pioneer and a rival of the Wright Brothers, Glenn Hammond Curtiss. The family developed of Miami Spings, Hialeah, Opa-locka and the beginnings of neighboring Doral. 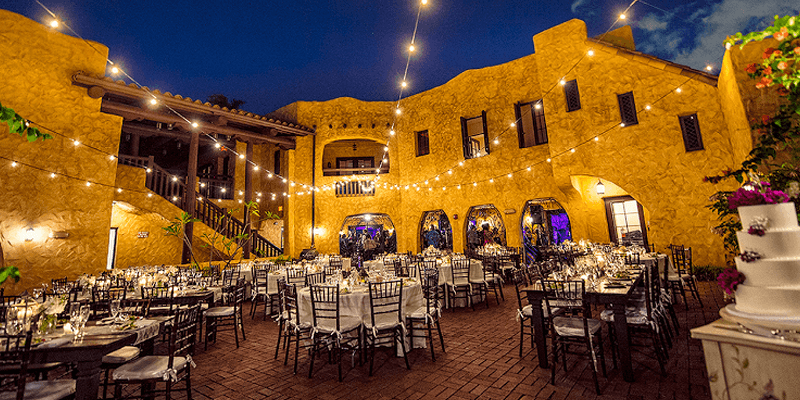 Wedding Venue like Curtiss Mansion is one of the largest and most architecturally distinguished Pueblo Revival residences associated with Curtiss's Miami Springs development. Its recent 2012 profound restoration has brought it to its original beauty and will surely impress your family and friends at your wedding. There is much long lasting history in Miami Springs. Curtiss Mansion’s grounds and courtyards boast beautiful views of the Miami Springs golf course and adjacent lake. Its age old, deep rooted oak trees make Curtiss Mansion the perfect outdoor venue for catering your wedding or event. If you want a romantic wedding or catered event reminiscent of the glitz and glamour of the 20’s, Curtiss Mansion is “The Great Gatsby” wedding venue you are looking for. So why not impress your adoring wedding guests with a little history mixed in with the flair of our top catering menus for your wedding or catered event? It will definitely not disappoint and will truly make your event memorable.